What is a Flanged Roller and Why Use it for Pallet Flow? 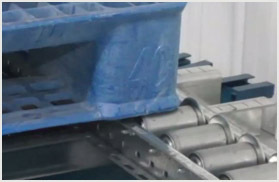 A simple design variation – the flanged roller for split roller pallet flow – was developed by Mallard’s engineering team to prevent certain unique loads and plastic pallets or totes from drifting off the pallet flow track. Unlike traditional wooden pallets, these loads have a tendency of wandering as they flow. A flange, added to the outer edge of the exterior rollers, essentially creates a self-guiding lane by capturing the pallet as it travels, preventing drift while maintaining a smooth, consistent flow. Mallard’s in-house design and testing lab is where our custom design process begins. This video is a great example, featuring a client application using flange split roller pallet flow with various simulated loads on plastic pallets. Adjustments are made as needed until the optimal solution is found. Flanged rollers are available in 2 and 3 rail, split roller pallet flow systems. If you have unique loads or plastic pallets, consider having your pallets evaluated in our lab. We’ll help you determine if a flanged roller design vs. traditional full/split roller pallet flow is the right fit for your application. great for totes and light cartons.